I am a fan of historical fiction novels but I have to admit that they usually revolve around some intrigue happening in the Tudor court and not the Spanish Influenza. 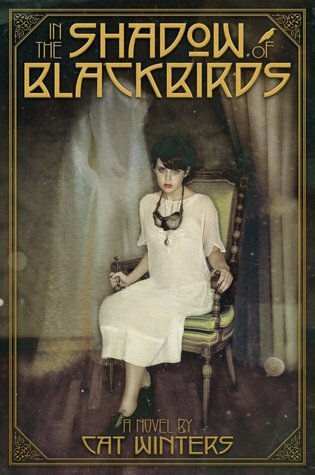 To be honest, it was the cover of this book that first caught my eye while browsing Netgalley, and once I read the blurb it was the addition of séances and spirit photographers that really made me request it. In truth, I started the book on a whim, and couldn’t put it down. Mary Shelley Black is forced to live with her aunt in San Diego after her father is arrested. She isn’t completely new to the area, she spent a lot of time there as a child, and has many memories there of herself and her childhood sweetheart, Stephen. Stephen has since left for the war and it isn’t long after Mary Shelley arrives that she finds out that Stephen has died. As she struggles to overcome this heartache, Mary Shelley begins to be visited by Stephen’s tortured spirit. It seems that Stephen can’t move on until he comes to terms with his death, and he’s determined to use Mary to find out some answers. In the Shadow of Blackbirds has so many layers that it is hard to begin to describe its intensity. As stated above, it is a historical fiction novel, and Cat Winters did an excellent job in describing the austere and frightening time period in which people were struggling with the effects of war and death. I found myself shivering at the thought of a flu outbreak and nearly sobbed over the details surrounding the war. Through this backdrop there is also a beautifully heartbreaking love story between Mary and Stephen. Though Stephen is only portrayed alive in Mary’s memories, his ethereal character was very real and deeply moving. I found myself somewhat surprised at how much this relationship touched me and made my heart ache. The underlying plot of this novel is of course the mystery, and being an avid reader I am very rarely shocked while reading. Cat Winters leaves many puzzle pieces throughout the novel and to be quite honest, I really thought I had it all figured out. As the novel climaxed and secrets were revealed I was stunned, horrified, and rather shaken to find that things were not at all what they seemed. In an effort at full disclosure I have to share that I lost someone very close to me a few years ago in a very traumatic way and I couldn’t help but feel connected to the story on a very deep level. As a spiritual person, I connected to the way in which Mary gained more precious moments with her love, long after his time on Earth was over. My heart ached for those moments and I couldn’t help but feel bittersweet feelings over their relationship after death. Cat Winters captured real, heart wrenching emotions that I could have never put into words, and I will forever be grateful. This is not a particularly happy read, but it is glorious, in the end. It is hard to find a specific audience for this novel as I really believe that it is fitting for all. If you enjoy layered novels, filled with historical fiction, mysterious, paranormal, and romantic elements, then this is the novel for you. This is a book that I am thinking about months after its conclusion. In the end, In the Shadow of Blackbirds will consume you, body and soul. This entry was posted in Reviews, Young-Adult and tagged death, ghosts, historical fiction, mystery, paranormal, photographs, romance, young adult. Bookmark the permalink. I don’t know why, but I’m super curious to read about times during the Spanish Influenza… It just seems interesting and the historical time period could really grab my attention! Would you recommend this one for me or do you think it’s one that wouldn’t quite fit my reading tastes? Great review-I wasn’t originally interested in this book but then I found out it was set during the Spanish influenza and I had to have it. I couldn’t believe how powerful a read it was and I’m glad I gave it a shot. Fantastic review! I’ve been meaning to get to this one but there have been so many great books coming out this month! I was disappointed by the last historical w/ paranormal elements I read, so I hadn’t quite been in the mood for another yet, but this sounds like it will renew my faith in the subgenre! That cover freaks me out. I must have it! I do love a good scary book – which is weird because I REFUSE to watch scary movies – but a historical one seems to be even scarier! Fabulous review and hope that I can get a chance to read this one soon! I LOVED In the Shadow of Blackbirds. I wanted to read as soon as I read the synopsis. I didn’t even really question whether I wanted to or not. Mary Shelley is such a wonderful character. I sort of want to read about Stephen when he was still alive, but I wouldn’t change the book for anything. I can’t wait for Cat Winters’ next book. dksjvbfjkbds!